The Oviedo Heritage, a supplement for The Oviedo Outlook, published on June 30, 1977. 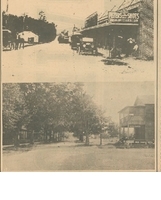 This article, by Donna Neely of the Oviedo Historical Society, chronicles the history of Oviedo, Florida. According to the article, Oviedo began on the south shore of Lake Jessup as a settlement called Solaria's Wharf. Some of its early settlers include Dr. Henry Foster, Joseph Watts, and Steen Nelson. Citrus and celery dominated the area's farmland, although Central Florida suffered a severe freeze in 1894. Oviedo suffered another disaster in 1914 when a fire wiped out much of the downtown section. Disaster hit again in 1929 with the Wall Street Crash and the beginning of the Great Depression. That same year, Oviedo's fruit crops were decimated by a fruit fly infestation. Another fire destroyed the Wheeler Fertilizer Plant in 1946. Nonetheless, Oviedo continued to grow, with new paved roads going to Geneva and Chuluota and the opening of the Citizens Bank of Oviedo in 1948. In 1949, Oviedo began receiving once-a-day bus service to Orlando from Greyhound Lines. By 1950, Oviedo was the second largest town in Seminole County, following Sanford. The Oviedo City Hall was built that same year and in 1968, Florida Technological University (present-day University of Central Florida) opened, bringing new residents to the area. Original newspaper article: Neely, Donna. "Oviedo Began as Solaria's Wharf." The Oviedo Heritage, June 30, 1977: Oviedo Historical Society, Oviedo, Florida. Digital reproduction of original newspaper article: Neely, Donna. "Oviedo Began as Solaria's Wharf." The Oviedo Heritage, June 30, 1977. "The Oviedo Heritage '77, June 30, 1977." RICHES of Central Florida. https://richesmi.cah.ucf.edu/omeka2/items/show/5702. Originally created by Donna Neely and published by The Oviedo Outlook. Neely, Donna. “Oviedo Began as Solaria's Wharf.” RICHES of Central Florida accessed April 20, 2019, https://richesmi.cah.ucf.edu/omeka/items/show/5703.